How do you get rid of acne scars? This is a common question and many people want to know the answer for there scars. There are many effective scar treatments on the market but what myacnelife looks at is “get rid of acne scars naturally” so find out the best ways to get rid of acne scars and fast! The dreaded acne always leaves its footprint.. The general cause for acne marks to appear on the skin are because of pimples, boils and spots, that previously caused an opening in the skin. These marks come in all shapes and sizes and normally a purple/red colour. These marks will eventually fade into scars and become a white colour. The good news is, not all acne pimples turn into scars. Acne marks can make ones back, face, neck, shoulders and chest not so attractive. Many people look for treatments to reduce the size and shape of these marks but fail because they do not understand about the healing process of acne scars and that you can get rid of acne marks and scars naturally . When acne is present, pimples, blackheads and spots will be visible on the surface of the skin. An opening in the skin is the most common cause for scars and acne marks to form and picking and squeezing pimples may cause acne marks. Generally, bloody spots or boils are more likely to cause acne scars. See why you should avoid squeezing pimples. Inflammation of the area will drive blood to clot and opened pimple then forming scar tissue once clotted. 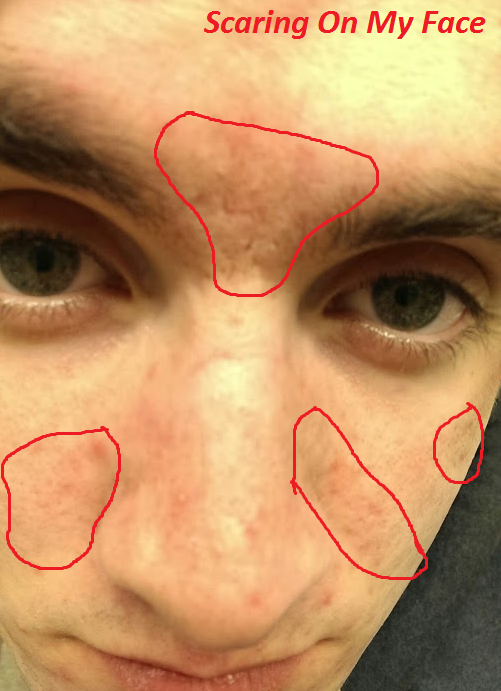 This cycle will form a red/purple acne mark that will later scar. How Much Will It Cost Dr Dermatologist? Dermatologists are skin experts for a reason. Their job is to know every skin condition, disease and the best way to treat. If you was to see a dermatologist about your skin, expect a large bill and a costly treatment for your acne. But, scars are a completely different ball game. Treating acne scars is not only risky but extremely expensive. Surgery is the only way to effectively remove scars however, the process commonly causes more scars than before due to the risk. Because of this, like I said before, natural treatments are where to start. There are many treatments, creams and peels that claim with directions on “How to fade acne marks”. However, many of these tropical lotions have side effects on the skin causing acne outbreaks and other skin activity. Depending on the best way for you getting rid of acne marks and scars, natural treatments are always a safe and should be considered FIRST. See what I used on my Acne scars and how I faded them naturally here. Acne scars are a glimpse of your past acne and are very hard to ignore. They form when pimples, spots and zits are picked or squeezed. Acne scars come in all shapes and sizes including pits, holes and raised lumps. But is there a way to Heal Acne Scars Naturally? We live in a world addicted to medicine, beauty and expensive treatment. Although these revolutionary new acne scar treatments work, many people forget about Mother Nature’s powers. The human body is incredible and with the right knowledge you can heal acne scars naturally and quickly. I want to share with you something that really helped my back acne scars improve, heal and reduce in size within a month. It is called The Scar Solution. This is an incredible way to remove acne scars naturally within weeks of use. It also comes with a 60 day 100% money back guarantee. When my horrific severe acne subsided (after 11 years) I was left with holes, pits and deep scars on my face, neck and back. My immediate thoughts were they are temporary, but I was wrong. After seeing my local dermatologist she suggested laser resurfacing of the scars to reduce their appearance. However the cost would burn a HUGE hole in my wallet and also there is a risk of MORE scaring. So I looked for a more natural way to heal my acne scars. I decided to invest in The Scar Solution as I found a link to receive it for only $37. Its normal price is $67. 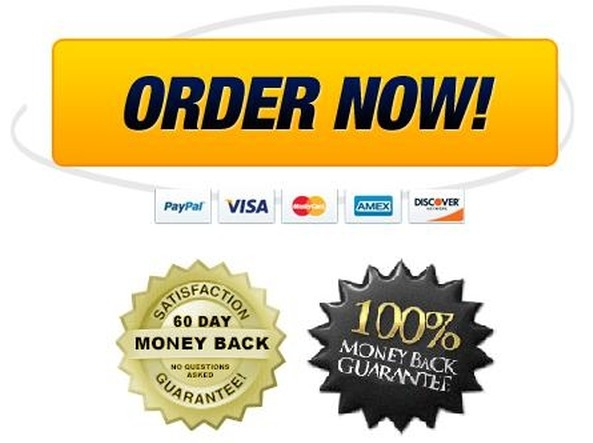 I will leave The Scar Solution discount link further down the page for you. After following the advice, recommendations and treatment I began to see results after one month of usage. I really was pleased how my hyperpigmentation scars had already began to fade. After several months of usage my scars had almost completely disappeared. However under close inspection you could still see signs of scarring. If you are looking for a How to Heal Acne Scars Naturally guide then The Scar Solution is for you. It will save you fortunes on expensive creams, treatments and supplements that all have side effects. This is how Mother Nature really can improve you scars, skin and also your complexion. If you are interested in learning more about this natural acne scar treatment then I suggest you CLICK HERE and save yourself 47% and purchase for only $37. Natural treatments are always recommended because the chances of possible side effects are very low. You will save money and still gain beautiful scar free skin within weeks of use. What’s Your Secret Natural Scar Treatment? Bio Oil For Acne Scars – Does It Work Or Break You Out? Bio Oil is a brilliant acne scar treatment that has won 126 skincare awards becoming the No.1 scar, stretch mark and skin toner product since 2002. Bio oil is widely used over 14 countries to this date and keeps up its reputation. Scars – All types including acne scars, surgery scars and scars from cuts and grazes. It comes in a small tub and contains the breakthrough ingredient called Purcellin Oil which is the main active ingredient used for penetrating skin and helping damaged tissue and scars improve. Using Bio oil twice a day will greatly reduce scar size, colour and the surface of the skin that it is applied. This small orange tub with a noticeable white screw cap can be found at your local pharmacy/drug store or on Amazon here. Many have claimed this to be a miracle for their skin because it ‘minimises scars, stretch marks and uneven skin tones’ on the surface of the skin. Before you consider buying, trying and using bio oil I strongly suggest you read on to find out what really happens and how to use Bio Oil for Acne prone skin for the best results. Does Bio Oil Work on Acne Scars? Acne is a skin condition that produces more oil in around the pores of the acne prone areas, such as the face, neck, back, chest, and shoulders. The scars that acne leaves are look generally like holes of all sizes and plenty of them. 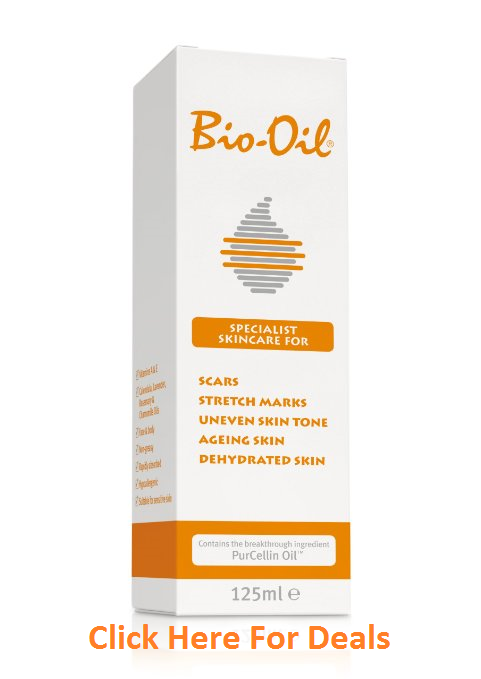 Bio oil is a great way to help acne scars especially visible ones on the face, chest and back. Applying twice a day will reduce the size of acne scars and help the healing process of all scars in the area. However there is one problem with Bio oil and acne prone skin. If your acne is active for example, acne breakouts of pimples, blackheads and cysts are recurring everyday then I do not recommend using this scar treatment. Using Bio Oil for acne prone skin is completely different when it comes to the possible side effects that can occur from the ‘Oil’ on oily acne skin. You may or may not know that acne is a build-up of oil, bacteria and dead skin cells in and under the skin which causes eruptions of blemishes, blackheads and pimples. The excess oil on skin from acne and hormonal acne can cause acne breakouts especially when adding extra oil to acne areas. Breakouts and the opposite effect of clearing skin for acne sufferers can occur because Bio Oil’s thickness can help clog pores. Resulting in inflammation, oily skin and more acne pimples. People who generally have oily skin from acne will not gain clear skin from using Bio oil. This is not an acne treatment but an effective scar remedy that can greatly help acne scars, not acne. The best advice would be to use Bio oil on scars where acne is not present. See how I got rid of my acne within a couple of days here. Bio Oil is more commonly used on scars and shouldn’t cause acne breakouts on areas like arms, legs and lower body because these areas are not prone to acne and instead its helps keep skin hydrated and ageing skin looking clearer. However if you suffer from dry skin or an adult suffering from acne, bio oil could be more beneficial for you because your acne is not caused by excess oil build up, this will help treat acne effectively and reduce scars. The first thing you will notice when opening a bio oil pot/bottle is the distinctive smell. Like a mix of baby shampoo and washing up liquid. Being an oily liquid it is easily over spread and can be messy whilst applying to the skin. Underneath the cap is a narrow drip hole to prevent too much coming out at one time. Apply a small amount (pictured) to scarred tissue areas and then gently massage into skin until fully absorbed. Do not over use or apply to much. Dime size amount is more than enough. Bio Oil is a leading brand and can be bought over most counters but the price can be from higher for Bio Oil in the shops than online. Find the best price for Bio Oil by Clicking Here. How Did Bio Oil Work For My Acne Scars? In the first 2-3 weeks of using Bio oil for acne scars on my face and back I noticed a change in colour and swelling. My scars appeared to fade and risen scars smoothed out. However I still have pot holes in my skin from the evil acne I once had. I didn’t give up, I carried on. 2 and a half months later my scars had definitely improve all round and they became less noticeable, LIKE ALMOST VANISHED. Especially the big holes I had around my cheeks and side of nose. Would I recommend bio oil for scarring? Yes, because this oil shown me good results with my acne scars and it will show results on stretch marks, and other types of scars within weeks and definitely within months. The oil helps rebuild skin complexion and digs deep into scars to reduce inflammations, redness and help rebuilding scar tissue. This is a product that everyone must have on everyone’s shelf. No more than twice a day morning or night to see best results, should be gently rubbed with the fingertips into the skin. It’s very important to massage in circular patterns and if you do this correctly, improvements will continue to be noticed the longer Bio Oil is used. 1. Pour a small amount (Roughly a 1-2 drops, a little bit goes a long way) of Bio oil onto fingertips. Bio oil is much cheaper online! 3. Massage thoroughly in circular patterns until completely absorbed paying attention to scarred areas. Bio Oil is an excellent way to keep skin moisturised, help scarring and improve the skin but is unfortunately very oily and can cause breakouts on acne prone skin on the back, chest, face and neck. This being said is a general term and every ones skin is different and unique in many ways. The best option for you if you have acne scars but still have acne is use it with caution as directed and see why this acne treatment is becoming as popular as Accutane. If you are considering using it on your acne I reassure you that there are a high number of people saying good Bio Oil for Acne Prone Skin and helped there acne scars clear up completely. Everything is cheaper online these days, treat yourself to a 30ml for here for the same price as a 10ml in store. 2018 Update – Bio Oil is fantastic, however I been using a new treatment which has completely changed my life. Read more about it here.